I hope you had a lovely and productive week. I am badly lacking behind the posts and for the first time in three years, I haven't posted over a week. I hope you will be patient with me from April to the end of June. This semester I have many courses to teach, some of them I am teaching for the first time. Moreover I happened to get involved in many projects at once, some of these are due to sheer luck so I couldn't plan accordingly but I didn't want to miss the opportunity. When I was away last week, I also happened to miss the 3rd blog anniversary. It was the 1st of April. I can't believe that I am doing this for so long. Back in 2013, after six months of home stay due to health issues, I got into make-up to distract my mind. I always liked make-up even back in high school but I was never that much obsessed with it, read the amount of make-up I had could be used up in a year or two. During the last three years, I learned so many new things from how to judge a formula of an eye shadow or lipstick to how to take product photos. I am still in learning process though and this is one of the reasons why I keep doing it. Being the editor-in-chief, the photographer, PR contact and social media expert of such a tiny project called Color Me Loud still excites me today. I would like to thank all the readers for keeping up with me and making it such a pleasant experience as the humble blog which I started three years ago is expected to reach 5 million page views in a few months. 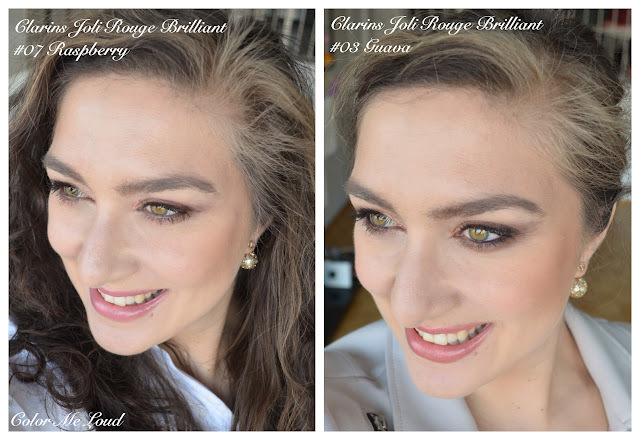 I have been testing some new lip products from Clarins last week. 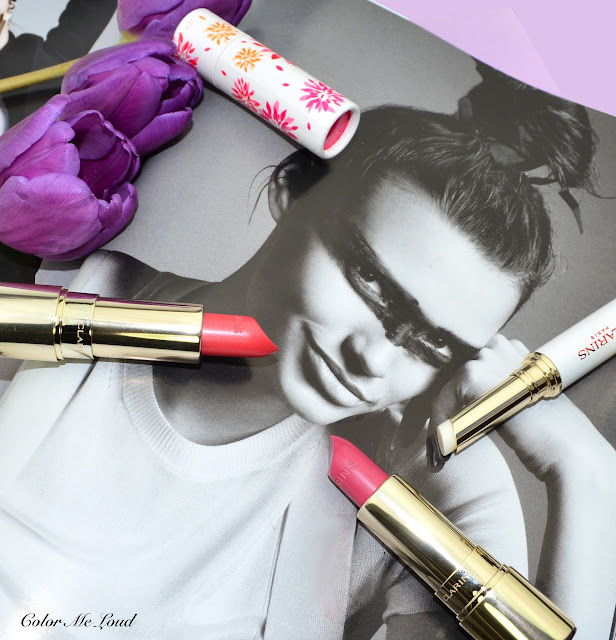 The brand released a new sheer glossy lipstick Joli Rouge Brilliant after the revamped their Joli Rouge packaging and formula last Fall (review of Rose Berry is here). Together with this release they also introduced a Lip Perfecting Base to Eclat Minute line. My thoughts and some swatches are after the jump. The packaging of the product is the same as the regular Joli Rouge redesigned packaging. It feels nice in hand, not too light, the golden appearance gives it a luxurious twist. The cap is safe and click closed. There are nice details as a small C letter on the cap where it makes a dent. Joli Rouge Brilliant is given to be a Moisturizing Perfect Shine Sheer Lipstick which matches the product perfectly. It has 3.5 g (0.1 Oz) of product and retails around 27€ in Germany. 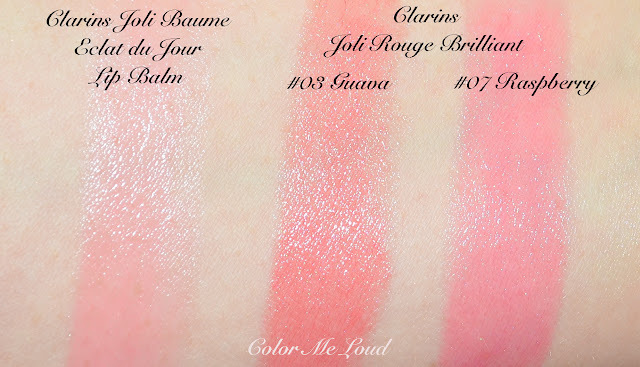 Clarins Joli Rouge Brilliant to me is from the new generation sheer shiny lipsticks, which applies almost as sheer as a lip balm by the first pass but the shade can be build up with multiple passes. I found the formula to be close to Guerlain's new La Petite Robe Noire range (reviewed here) or Dior's new Addict Range although I like the packaging of Clarins more than the other two. My only complaint about the formula would be that the product is heavily perfumed although at this point almost all the luxury lipsticks are perfumed, so I learned to live with that. The longevity is around 2 hours if you don't eat or drink, which is close to any other similar formulas. From two of the shades I have, Clarins Joli Rouge Brilliant #03 Guava is a lovely pink coral which pulls cooler on me than it swatches on my arm. #07 Raspberry is exactly my type of a mauve, pink tone which turns out to be my my-lips-but-better shade which I really enjoy at the moment to apply right before the class. It keeps my lips hydrated and gives a touch of color. You can see my wearing both of the shades in FOTDs below, take these with a grain of salt though since the transparency of these lipsticks make it look different on everyone. 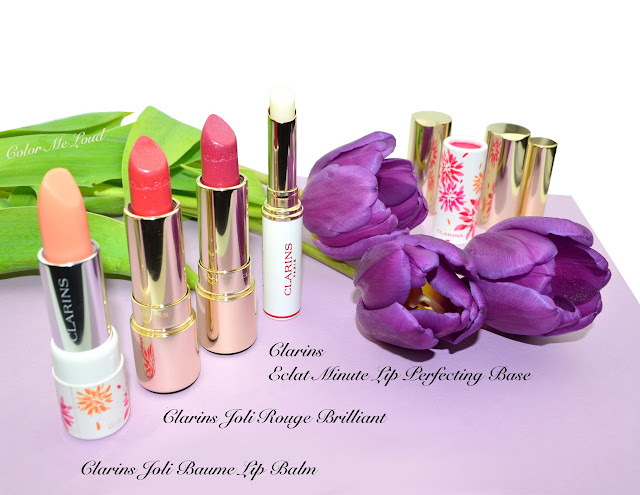 This year Clarins releases their Lip Balm in a limited edition packaging with abstract flowers of pink and orange printed on the card board package. The product has a lovely pink hue, which brightens up my complexion really nicely. I love the consistency of the lip balm and how it feels on my lips. It as a fruity smell, which is not too strong. I really like the product but I can't go pass the cardboard packaging somehow and I ask myself why not plastic? Although cardboard is thick and stable, I feel that it is not robust enough to toss in my hand bag. Clarins Joli Baume Lip Balm doesn't break the bank as it is priced at 11.99€ for 3.5 g (0.1 Oz). Instant Light Lip Perfecting Base completes the other base products from the brand with the same name, such as Eye Perfecting Base (reviewed here) and Instant Concealer (reviewed here). 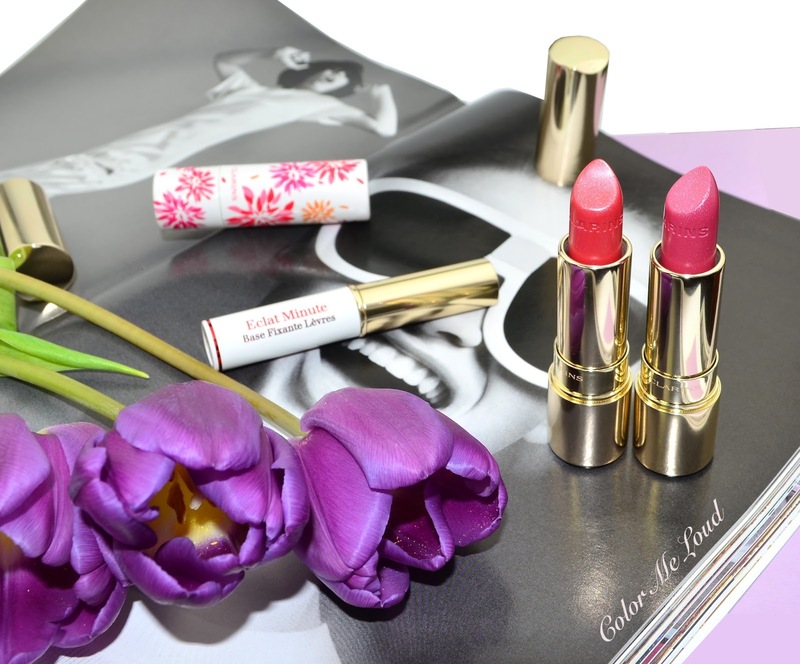 There is also a lip color range with the same name, such as Instant Light Lip Balm reviewed here. I really like the formula of this one, which does a great job in many ways. It neutralizes the lip color while filling the lip lines and prolonging the longevity of the lipstick. That said unfortunately mine broke by the third application from the base. Thanks to the long neck of the packaging, I can still use though. I wished Clarins would release a thicker version of this bullet with more product and more stability during application. Clarins Instant Light Lip Perfecting Base has 1.8 g (0.06 Oz) of product and sets you back 19€. Final thoughts: I am really loving the new Joli Rouge Brilliant range which offers a casual color to swipe and go without a mirror but it can be build up to show color while moisturizing the lips nicely. Joli Baume Lip Balm has a very nice formula and a touch of color which brightens the complexion but the cardboard packaging gets a thumbs down from me. Instant Light Lip Perfecting Base neutralizes the lip color while smoothing out the lines but since the product is very thin, it ends up breaking easily. Good news is that you can still use it even after that. Do you like sheer lipsticks or do you prefer opaqueness? I appreciate both types: opaques with low eyes and sheer with bright/smoky eyes ! Bonne semaine ! Et courage pour les cours !